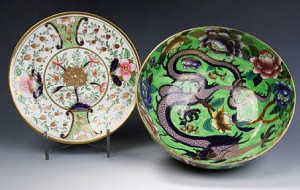 Pictured: Maling lustre bowls – Decorated to the interior with a single dragon amongst flowers and to the exterior with flowers, 24cm diameter and a swansea floral decorated dish with gilt highlights 21.3cm diameter both factory marked. Sold at Bonhams, Edinburgh for £114 May, 2007. Image Copyright Bonhams. The Maling family were originally French Huguenots who fled their native country in the 16th century to escape religious persecution. The family settled in England where they became prosperous merchants. 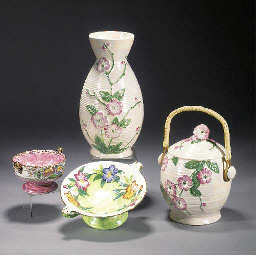 The first Maling pottery was established at North Hylton, near Sunderland, in 1762 by William Maling. He had interests in coal, timber and shipping, and the development of a pottery business fitted well with these. Pots fired in kilns heated by the locally-dug coal could be exported in William’s ships, which would eventually return from Europe with timber. 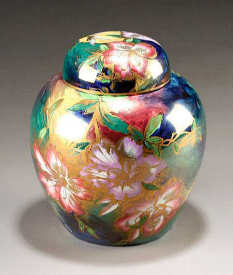 Pictured: A Maling lustre-glazed ginger jar and cover Printed and painted with purple and pink azalea flowers on a blue and green brushwork ground with gilt highlighting. 18.5cm high, printed marks and painted 3773. Sold at Bonhams, Chester for £240 Aug, 2007. Image Copyright Bonhams. Pictured: A collection of Maling including vases, bowls, a jug, biscuit barrel and a lidded box, printed marks (tiny nick to cover of box) (9). Sold at Christies, London, for £35 3 Feb, 2002. Image Copyright Christies. The driving force behind this expansion was Mary’s husband, Christopher Thompson Maling. It is his initials which form one of the company’s early factory marks – the letters CTM inscribed vertically inside a triangle. Later, this was extended into the trade name “Cetem Ware” when the company adopted its well known trademark of a castle in the early years of this century. The “Cetem” name continued to be used into the 1930s. Frederick Theodore Maling, the last family member to be actively involved in running the pottery, died in 1937. However, the Maling name (which had first appeared with the castle mark in the 1920s) continued to be used as a trademark until the factory finally closed in 1963. Pictured: ‘Aztec’ a Maling tea for two, painted in colours, printed marks (tiny nicks to one saucer) — height of teapot 14.5cm. (9). Sold at Christies, London, for £1,528 Feb, 2002. Image Copyright Christies. The outbreak of war in 1939 marked the beginning of a long decline. 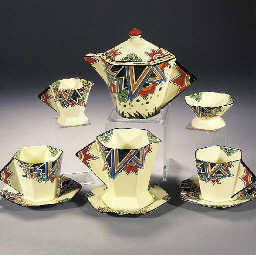 Many of the factory’s workers were called up for military service, and wartime restrictions prevented decorative ware being produced for the home market. The factory was eventually sold to new owners, but struggled to compete against foreign competition because of its depleted workforce and outdated equipment. The contract to supply crockery to the London and North Eastern Railway Company was lost to a Japanese firm who were able to undercut Maling’s price by 75 per cent. Finally, the factory lost their contract with Ringtons, a north eastern tea company for whom Maling had produced tea caddies and other items since the 1920s. When the factory closed its doors for the last time in June 1963, the headline in the local Newcastle “Journal” told the story – “Competition kills city firm”. For further information, please visit the Maling website.